Herzog's SMART GPS trains permit precision ballast unloading while avoiding facilities such as grade crossings and other no-dump areas. Photo – Herzog Railroad Services Inc.
Ballast management is a critical element of track maintenance, and as ever, North American railroads plan to install/manage tons of it this year. Among the Class Is, BNSF Railway Co. plans to install 4.7 million tons of ballast, according to Progressive Railroading’s 2018 MOW Spending Report, which was published in the April issue. Norfolk Southern Railway plans to install 2.1 million tons; CSX, 2 million tons; and Canadian Pacific, 750,000 tons. Regionals and short lines are distributing it in big numbers, too. For example, the report showed Progressive Rail Inc.’s seven short lines plan to install 500,000 tons this year. Montana Rail Link expects to install 116,000 tons; OmniTRAX Inc.’s 21 short lines, 58,000 tons; the Belt Railway Co. of Chicago, 26,000 tons; Iowa Interstate Railroad Ltd., 25,600 tons; and the Alaska Railroad, Central Maine & Quebec Railway and Iowa Northern Railway Co., 20,000 tons each. And there is no shortage of suppliers and equipment providers to help railroads ensure all that crushed rock is distributed and maintained properly. Progressive Railroading recently asked a cross-section of companies to share information on their latest ballast delivery, installation, maintenance and service offerings. Emailed responses from 13 suppliers follow. Herzog Railroad Services Inc.’s ballast management offerings include custom-designed control systems and optimized conveyor components. The company’s patented Automated Conveyor Train (ACT) enables railroads to unload ballast in curves and s-curves with multiple materials in one consist. Additionally, the equipment unloads in a precise location with one technician inside the discharge cab, safe from exposure to silica dust and other elements. The unit also allows for multiple grade crossings to be unloaded, and — thanks to a “pause” button — no reset time is required at each location. The ACT automated plow is suited for many applications, including washouts and new construction, and the entire unit can be customized. Meanwhile, Herzog’s patented PLUS and SMART GPS trains continue to help railroads minimize track time for MOW work trains and improve safety, the company says. 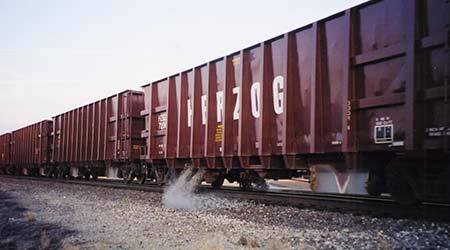 Herzog’s GPS trains permit precision ballast unloading while avoiding facilities such as crossings and other no-dump areas. Once the pre-survey is complete, the GPS train can be unloaded from either direction and can pick up where a previous GPS train left off. Loram Maintenance of Way Inc.
Loram Maintenance of Way Inc. offers services and equipment designed to enable MOW crews to undertake any shoulder ballast cleaning program. The company now is working to further optimize the operation and production of its latest ballast maintenance program unit, the SBC2400 shoulder ballast cleaner. Loram’s latest ballast management production unit is the SBC2400 shoulder ballast cleaner. The machine continues to experience increased average operating speeds with each deployment, the company says, adding that the higher speeds result in reduced unit costs and higher work-volume completion. 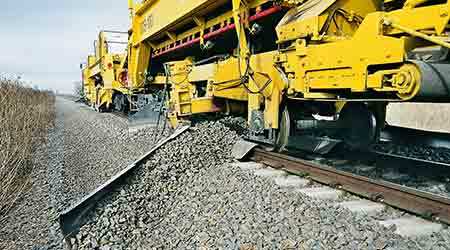 Some railroads are including a shoulder ballast cleaner in a surfacing gang arrangement. Coordinating ballast equipment with gangs has proven to exceed individual machine deployment production and reduce overall costs, the company says. 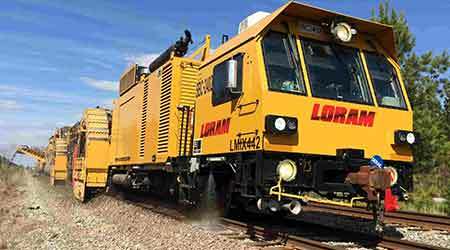 In addition to the SBC2400 and other shoulder ballast cleaners, Loram ballast maintenance program offerings include undercutting, high-speed track lifting, and spot undercutting/excavating/trenching. Progress Rail integrated microprocessor control systems into all Kershaw model ballast regulators to simplify and improve operator interaction with major systems. Because railroads value having machines that can think intuitively and alert operators to potential issues before they occur, Progress Rail recently integrated microprocessor control systems into all Kershaw model Ballast Regulators to simplify and improve operator interaction with major systems. All operator control functions, machine status indicators, engine display parameters and engine codes now are displayed on a 12-inch industrial touchscreen monitor. Integrating this new technology helps simplify machine wiring and greatly improves the machine’s ability to report critical information back to the operator and mechanics, the company says. Progress Rail also recently released a new brushcutter attachment that can be adapted for the Kershaw model 60 Ballast Regulator to enhance vegetation management. It converts into a snow-removal machine, too. RCE Equipment Solutions Rail Division enhanced its Railavator product line and undercutter bars. The RCE Equipment Solutions Rail Division recently enhanced its Railavator product line and undercutter bars. RCE now supplies a full range of models — from compact excavators to 35-metric-ton excavators — with undercutter bars ranging from 9 feet to 15 feet in size. With more options, RCE customers can perform undercutting with all of the company’s hi-rail and standard excavator models, the company says. RCE’s largest machine, the 350G, now offers additional hydraulic power to perform in difficult conditions, and its longer bar is beneficial for switch undercutting. Meanwhile, the smallest undercutter bar, at 9 feet, has been “well received by railroads as an alternative to larger machines and bars,” the company says. 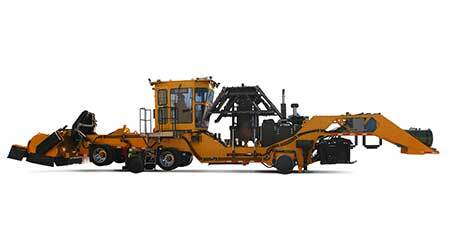 GREX’s DumpTrain for Curves (DTfC) “continues to see broad acceptance across multiple Class I roads,” the company says. Released in 2016, the DTfC delivers the same volume of material as the original DumpTrain, but with the added flexibility to unload in sharp curvature. The units are used for stockpiling, washout repair and track construction. The DumpTrain for Curves “continues to see broad acceptance across multiple Class I roads,” GREX says. 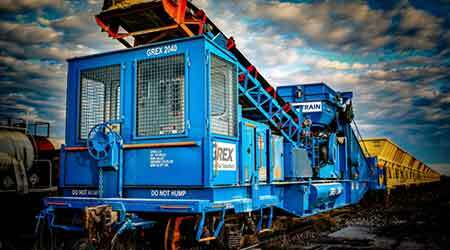 The DTfC builds upon the experience GREX learned from the original DumpTrain, which Class Is have used for more than two decades to gain “fast, pinpoint delivery of aggregate and base material,” the company says. With the DTfC, one GREX operator can unload 1,500 tons of material in as little as one hour. The curve trains also are equipped with a plow mounted on the stacker car, enabling it to move rock in washout situations where material is being dumped directly in front of the consist. With more than 20 years of experience, GREX operators can work with a variety of materials “in any kind of weather,” the company says. This year, GREX plans to roll out its second-generation Solaris and GateSync products, which are designed to provide robust ballast car unloading solutions. More than 2,000 of the kits have been deployed on customer-owned ballast fleets. The second-generation GateSync solution features a 2.4 GHz two-way wireless communications protocol, which enables users to closely monitor gate status, temperature, battery voltage and more on each car without visual confirmation. The system allows for unloading via wireless remotes, toggle switches or in a fully automated mode. To provide cost-efficient ballast-equipment options to Tier 4 engine packages, Knox Kershaw Inc. offers factory remanufactured Knox Kershaw Ballast Regulators. The remanufactured machines come with a new-machine warranty and Tier 3 engine packages. All components are new or refurbished, and trade-in allowances may be offered on some machines, the company says. The KBR 925 is designed for ballast work on all track types. 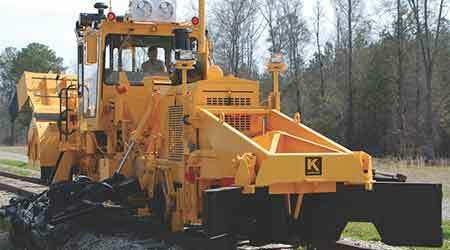 The KBR 925 is designed for ballast work on all track types. It offers high visibility in every direction, making it ideal for final profiling, the company says. The reversible wings allow work in either direction, and the one-pass transfer plow used in conjunction with the wing eases the process of transferring from shoulder to shoulder, the company says. The insulated broom box provides long service life and the standard reversing valve allows ballast to be swept away from switches and crossings, the company says. To meet silica dust requirements, Knox Kershaw now seals the cabs with a higher-performance pressurizer. For harsh environments, snorkel kits also are available. Plasser American Corp.’s BDS100/200 Ballast Distribution System is designed to restore the proper ballast profile. The shoulder plows are capable of retrieving ballast that is out of the reach of conventional ballast regulators, and the ballast broom loads excess ballast while working in a one-pass operation, the company says. The BDS100/200 Ballast Distribution System is designed to restore the proper ballast profile. 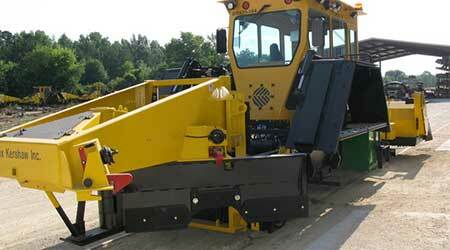 Plasser’s Ballast Distribution System features two units that can work together or separately. 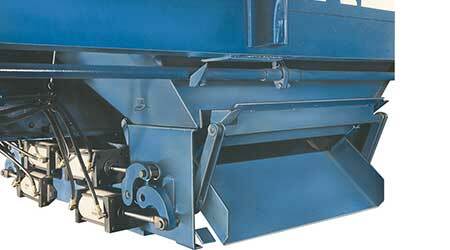 The BDS100 has a ballast hopper, four ballast distribution conveyors, and shoulder and X-type plows. Meanwhile, the BDS200 offers two brooms. The “pick-up” broom sweeps excess ballast from the track and transfers it into the BDS100, and the “finishing” broom provides the final track dressing. Storage capacity of the BDS System can be increased by coupling Plasser MFS cars between the units. The BDS100/200 Ballast Distribution System can accompany high-speed tampers or work as independent machines to distribute ballast. Additionally, Plasser’s ballast profile measuring system, which features a high-speed 360-degree scanner mounted on the front of the BDS100, records existing ballast and compares it to a user-definable ballast profile. This can be used to direct the BDS system or guide ballast trains. Miner Enterprises Inc. offers safe, durable and maintenance-free ballast systems that can be applied to new or existing cars, the company says. The AggreGate® can dump ballast inside, outside or both sides of the rail simultaneously. The AggreGate® can dump ballast inside, outside or both sides of the rail simultaneously. Features include large guillotine door openings designed to stop ballast flow, easy-to-operate toggle-type linkage systems, and tapered doors for easy ballast shutoff at switches, crossovers and bridges. In addition, the remote-control AggreGate enables users to deposit ballast while remaining a safe distance from the activity. Discharge outlets are available in manual, air-operated, electric and remote-control models. Engineered as a fabricated and completely assembled unit, AggreGate can be applied to new or existing hopper cars, the company says. Over the past year, Miner also has improved the internal electronics of all AggreGate systems, including the Stand Alone System, which enables independent operation of the car from anywhere within a ballast train — eliminating the need to group manual and automatic cars. The company also added a stand-alone lighting system that uses solar panels to store energy during daylight hours and power LED work lights for night ballasting. Montana Hydraulics LLC offers the Grizzly Lift Kit, a hydraulic lifting system for traditional side dump MOW cars. The company provides field services for more than 1,000 MOW cars on the BNSF Railway Co. system, as well as designs and fabricates multiple MOW car enhancements. The Grizzly Lift Kit is a hydraulic lifting system for traditional side dump maintenance-of-way cars. The Grizzly Lift Kit is undergoing field testing on BNSF equipment in regular MOW aggregate delivery service, and the prototype has operated successfully for more than six months with successful results, the company says. The Grizzly system does not store air — it uses minimal pressure to actuate a direct drive system. With the predictable and controllable lifting action, no launching of the load occurs, allowing for better material placement and increased safety for ground personnel, the company says. 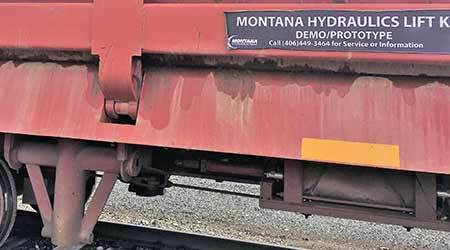 Montana Hydraulics also offers the Bi-Directional Ballast Plow, which operates on more than 200 railroad-owned ballast cars throughout the western United States. The BTE-450 features a long-reach extend-a-hoe and a hose reel to power hydraulic hand tools, and its large-capacity front bucket has full range of motion while on rail. 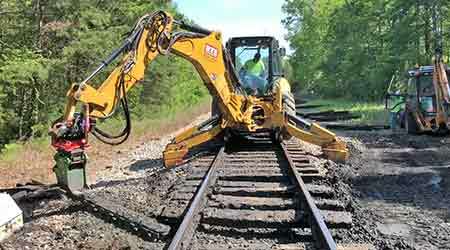 The BTE-450 Hi-Rail Backhoe from Ballast Tools Equipment (BTE) is a field-proven workhorse for repairing and maintaining track ballast, the company says. It includes a full line of rail-specific attachments, making the largest backhoe in BTE’s lineup also one of its most versatile machines, the company says. Changing attachments is quick and easy, BTE adds. With its hydraulically actuated front and rear hi-rail gear, the BTE-450 can hi-rail to the jobsite with the tool carrier full of attachments. The unit also can be used for a range of track maintenance and repair projects, including undercutting, tamping and pulling. The cab-operated hi-rail system has a frame-mounted pivoting front axle, and the unit can be maneuvered to work in difficult-to-reach areas. A new Dymax Ballast Tamper model offers two single-motor tampers that can be used separately on smaller machines or mounted together for a two-motor model. The Dymax Ballast Blaster features 360-degree rotation and bi-directional cutting teeth. It also has a patented automatic chain tension system, which prevents problems caused by loose or overtight chains. Mounted on backhoe loaders or excavators, the Ballast Blaster makes short work of washouts, compacted ballast and damage from derailments, the company says. Additionally, a new Dymax Ballast Tamper model offers two single-motor tampers that can be used separately on smaller machines or mounted together for a two-motor model. Built for tamping around switches, turnouts and crossings, the tampers increase productivity of the gangs, covering more length of track per day, the company says. Following extensive development and testing, Nordco Inc. plans to make the RoadReady™ surfacing team available to the industry in the fourth quarter. The team consists of the RST-1000 production switch tamper and RBR-1000 production ballast regulator. Both mobile machines feature industry-comparable production rates, the company says. Shown: Nordco’s RoadReadyTM RBR-1000 production ballast regulator. The RoadReady set is road-legal when towed, avoiding the need for over-dimensional or overweight permits. That way, customers can move the machines over highways to worksites without occupying critical train paths or waiting for highway travel permits. Nordco also offers a line of rail-bond ballast regulators and switch tampers. The M7 regulator provides high horsepower and powerful ballast-moving capabilities, according to the company. In addition, the HSTX is a highway-legal load switch tamper that provides a cost-effective tamping solution for customers requiring support tampers in tie gangs or chase tamping. Nordco also offers remanufacturing, repairing and rebuilding of equipment. Dubbed “R3,” the approach is designed to help customers avoid the extra cost of operating and maintaining the new Tier 4 engine packages over the life of the machinery, the company says. Vancer Railway Group offers the water-powered VCC50 Culvert Cleaner, which is designed to remove ballast and other debris from culverts quickly. The attachment provides power to clear ballast in order to keep track lines safe, and it enables operators and maintenance crews to complete projects safely and quickly, the company says. The Vancer Culvert Cleaner, which features a wireless nozzle controller, can accommodate various nozzle diameters from one-half inch to 15/16-inch for large and small debris removal, and clean out a plugged culvert in 15 minutes, the company says. The Vancer Culvert Cleaning attachment can be paired with one of the company’s hi-rail excavator models for quick access to remote track lines. 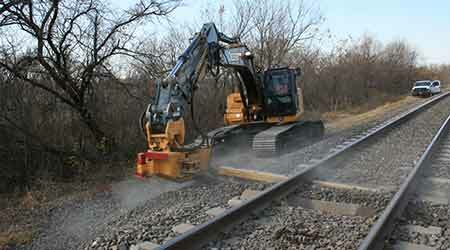 The hi-rail excavators also can couple to a variety of rail attachments.